Last week I travelled to Harper in Maryland County in Liberia. It’s quite an adventure. Not so much because of the distance, which as the crow flies is about a few hundred kilometers. But as there is no direct road, first you go north to the Guinea border, then east and south again to the coast. Because of the bad roads, it’s two days there and two days back. Maryland has never really recovered from the war, partly due to the lack of roads. Harper had been destroyed in the fighting and still wears an atmosphere of a paradise lost. Streets are full of the ruins of once grand residences, now without roofs and windows. Monumental staircases lead to nowhere. Ebola did not hit hard here, at least not in confirmed cases. But the collapse of the economy post-Ebola is being felt ever so strong. Everything is lacking here. Prices are often double than in the capital. One of the few positive things is that Caritas Cape Palmas (the Diocese of Harper) consists of an active team of young professionals who seem to have a grip on things. After returning home to Monrovia, we went to Grand Bassa County. Much more accessible via a new highway. Yet the communities we visited had never been reached with Ebola transmission prevention messages. 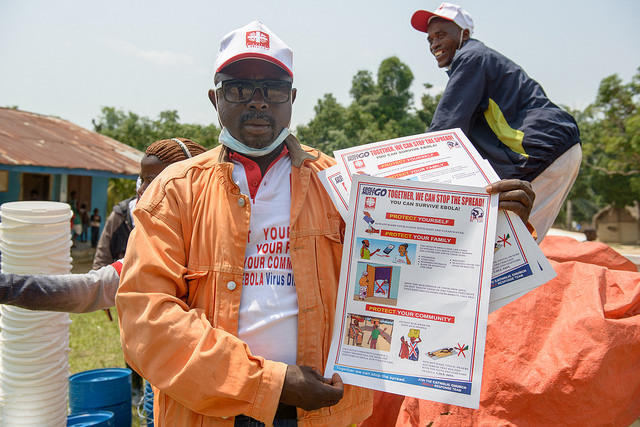 Caritas volunteers explained to the people how to prevent Ebola and distributed buckets, chlorine and soap. There is currently not a single confirmed case of Ebola in Liberia anymore. However, with still many cases in neighboring countries Guinea and Sierra Leone, people have to remain vigilant. The hand washing will be a good practice even after Liberia has been declared Ebola free, because the disease will still be prevalent in monkeys and bats and could strike again at any time. To draft a plan of action after June 2015, I went during Easter to Lofa and Bong counties. It was far into rural areas and into communities heavily affected by Ebola. There were many deceased, Ebola survivors and orphans. Talking to these people gives a good perspective on the aftermath of the crisis. The people have been in quarantine for many months. The harvest has been destroyed by roaming elephants and ground hogs. Farmers who were used to work in groups do not dare to get together anymore. During the quarantine period they ate all their reserve stock including the seed rice. If nothing happens now, there won’t be any harvest this year either.